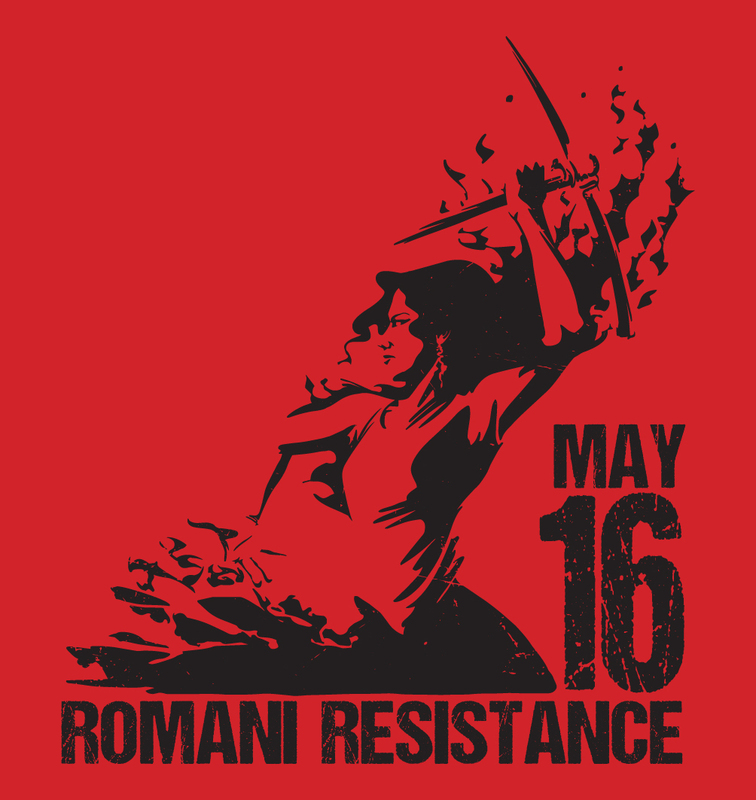 16 May is Romani Resistance Day. We, Rom, Sinti, Jews and Gadje/Gojim can make it a meaningful day, if we remember it together. To remember the Shoa/Porajmos may be an impulse to start a healing process leading to a society with less racism. To promote this, I am sharing the following text from Jenny Carol’s blog. It seems that genocide denial and racism are communicating vessels. An ethnic group whose genocide is denied continues to be targeted with racism. Conversely, the recognition of genocide can start a healing process in society that can help it overcome racism. The Romani Holocaust, called the “porajmos” (destruction) in Romanes, is a part of history that is not only forgotten today, it is even denied. It should not be. We do not know much about this aspect of the Holocaust. Some forgotten parts of the Romani Holocaust really deserve commemoration, however. Romani people did not always play the role of passive victims during that era. What happened on 16 May 1944? In the extermination camp of Auschwitz-Birkenau, section BIIe was called the “Gypsy Camp” (Zigeuner-Lager). Some of the Romani people transported into the hell of Auschwitz by the Nazis were not gassed immediately upon arrival, but were placed in the Zigeuner-Lager. BIIe was a “mixed” camp, which meant children, men and women were imprisoned there together. The Romani prisoners were forced into slave labor, observed and subjected to medical tests, and tortured. Auschwitz-“Doctor” Josef Mengele of the SS, a sadistic psychopath known as the “Angel of Death”, chose Romani individuals, most of them children, to subject them to perverse experiments. During the night of 2 August and the early morning of 3 August 1944, all of the remaining prisoners of the camp, without exception, were murdered in the gas chambers. Because of this well-known part of official history, 2 August is remembered as Romani Holocaust Day. But the Nazis had actually wanted to close BIIe and murder its Romani prisoners in the gas chambers earlier than that, on 16 May 1944. At the time there were more than 6 000 Romani prisoners there. On 15 May 1944, the underground resistance movement in the camp warned the Roma of what the Nazis were planning. On the morning of 16 May, the Romani prisoners did not show up for the usual morning roll call and ceased cooperating with the SS guards. The Roma barricaded themselves into their shanties. They had broken into an equipment warehouse and armed themselves with hammers, pickaxes and shovels, taking apart the wooden sections of the bunks they slept on to make wooden stakes. The children collected rocks. When the SS guards entered the camp in the late afternoon to take the Roma to the gas chambers, they began to fight for their lives. The Roma fought to the death. Children, men, and women all fought. Auschwitz had never experienced anything like it before and would not experience it again. There were losses on both sides. The SS were in shock because they had completely failed to anticipate this resistance. Concerned they might lose more men and that the uprising might spread to other parts of Auschwitz, they retreated from camp BIIe. No Roma died in the gas chambers that day. The Nazis subsequently put the prisoners of BIIe on a starvation diet. On 23 May 1944, they moved 1 500 of the strongest Romani prisoners to Auschwitz I, many of whom were then sent to Buchenwald concentration camp. On 25 May 1944, 82 Romani men were transported to the Flossenburg concentration camp and 144 young Romani women were sent to the Ravensbrück concentration camp. Less than 3 000 Romani prisoners remained in the family camp at BIIe, most of them children. On 2 August 1944, the Nazis gassed them all to death in gas chamber V, although the Roma fought back on that dark night as well.